Quality high speed broadband has become central to economic, community, and family life in the 21st century. However, according to a recent Minnesota Employment and Economic Development report, there are 252,000 Minnesota households that lack quality high speed broadband service. A majority of these are in rural areas. From the same report, 26.55 percent of rural Minnesota households lack quality high speed service, compared to less than two percent of Twin Cities metro area residents. In the mostly rural 27,000 square mile 8th Congressional District, about 55,000 households lack access to adequate broadband service. That is approximately one out of every five households. This is completely unacceptable. Without access to reliable quality high speed broadband service, rural areas will struggle to compete in the knowledge economy. Having quality high speed broadband service is estimated to increase a household’s income by at least $1,850 and can induce businesses to setup in areas that have access. Without quality high speed broadband service, small shops struggle to develop and maintain websites to sell their goods online and can’t accept credit and debit cards for transactions done in person, while lake resorts that are unable to offer reliable internet access to their guests, lose business to resorts that have quality high speed broadband service. While there are several federal programs and agencies that help fund rural broadband, the invested dollars are only a small fraction of what is needed to ensure quality high speed broadband service everywhere it is needed. Throughout the country, at least $55B will be required to buildout wired high quality broadband service. In Minnesota, this number is estimated to be about $1.4B, and in the 8th Congressional District it is about $300M. Due to the higher upfront cost of building out quality high speed broadband service in rural areas, a plan that uses a mix of private, along with federal, state, and local dollars is needed. Under this plan, the federal government would fund almost 40% of the $55B (about $21.73B) needed for rural broadband extensions and improvements. 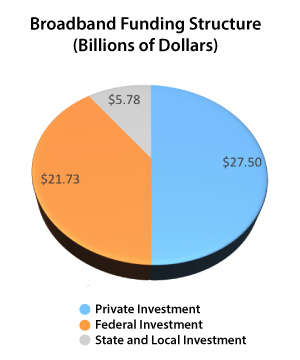 State and local governments would fund 10.5% (about $5.78B), and private sector investors and telecommunication’s companies would pay the remaining 50% ($27.5B). Leah Phifer’s plan proposes using the FCC’s Connect America Fund to support the government’s increased investment in rural broadband. Funding for the Connect America Fund comes from the Universal Service Fund contribution paid by telecommunications companies. During the 4th Quarter of 2017 this contribution from telecommunications companies totaled 18.8% of all revenues. Leah’s proposal would raise this contribution by 1.7%, to no less than 20.5% for four years, generating an additional $1B per year. Legislation would dedicate this additional $1B solely to building out rural broadband, bringing the federal government’s investment in rural broadband under the Connect America Fund to $5.5B annually. This additional funding will help ensure all Americans have access to quality high speed broadband service within four years of enactment. The only way to be globally competitive and begin to rebuild our middle class is to expand this access to all Americans. Equal access to reliable, high-speed internet is not a luxury in today’s high-speed economy, it’s a necessity. It’s also a rare issue on which there is bipartisan agreement. Leah looks forward to taking a step towards strengthening our economy by advancing support for this funding plan to expand broadband access all across Minnesota’s 8th District and the nation.